Many of us love the smell of lavender and enjoy its myriad of therapeutic and medicinal benefits. Its healing properties, in fact, have been touted as far back as ancient Egypt, Persia, Rome, and Greece. It is native to northern Africa, southwest Asia, China, India, and the Mediterranean. Locally, Southern California’s warm climate also provides a great environment for this fragrant herb, which is farmed in Ojai and throughout the region. 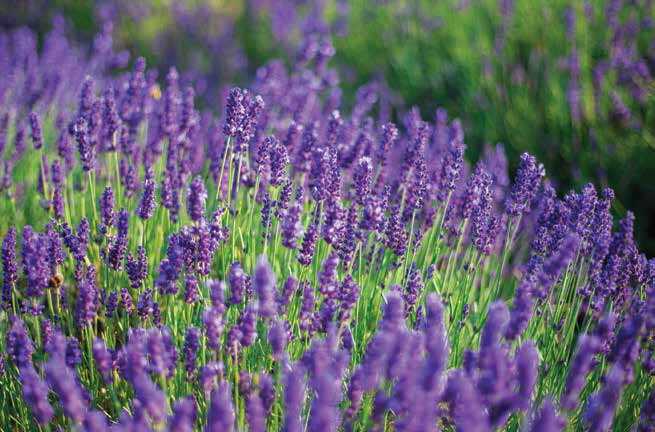 The lavender plant is a pretty purple shade and gives off a sweet aroma. Many chefs cook with lavender for its health benefits, subtle taste, and fragrance. It is part of the popular herbes de Provence. Lavender oil is also extracted from the flowering plant to create essential oils, which can be massaged into the skin, placed in a diffuser, or applied to a pillow or cotton and inhaled for aromatherapy. The aroma imparts a calming effect when sprayed, enjoyed as a tea, or stored beneath pillows to promote a good night’s sleep. However, the essential oil is toxic if swallowed. • An aroma that can positively affect mood, stress, anxiety, and depression. • Anti-inflammatory and antiseptic properties that help heal minor burns and bug bites. • Ability to counteract conditions such as eczema, acne, sun burns, and diaper rash when used as a lotion or shampoo . • Reduces hot flashes caused by menopause and PMS when inhaled for 20 minutes twice a day. • As a tea, aids digestive issues such as nausea and upset stomach. • Helps relieve pain from headaches, sprains, and toothaches. • Possibly prevents hair loss when applied directly to the scalp or used in shampoos. • As aromatherapy, helps patients manage the side effects of cancer treatments. Herbs provide powerful medicine and can interact with other medication. As with any herbs, it is best to contact your doctor before use to prevent any negative reactions.